I'm not sure either. The marriage seems to have been solid enough until they were exiled. I'm inclined to think that the marriage break-up resulted from the exile, but it's not clear whether Alice's mental illness came before the marriage break-up or after. Interestingly, the photographs I've seen of the Hesse funeral in 1937 don't seem to show Andrew. Surely he must have been there? Andrew was there--he didn't walk in the procession apparently. Maybe due to a combination of grief & age? Alice was there as well. It was their first meeting since April 1931--also her first meeting with her brother Louis since 1929. Alice came with Sophie from Berlin while Andrew brought Philip from England. Their daughter Margarita wrote to her Aunt Louise that they got on well together but that it was 'too hard' it took Cecile dying to bring them together again. Andrew took Cecile's death very hard as she was his favorite. He wrote to his mother-in-law that the weight of the grief just seemed to grow heavier as the weeks progressed. Andrew was 55 at the time of Cecile's death, so it seems unlikely that age alone was the issue. I do wonder apart from Cecile being Adrea's favorite, how did he get along with his daughters. Philip unfortunately did not have a close or loving relationship with his father. Yes, but wasn't his health somewhat broken by then? He didn't even live another 10 years. With the bitter November weather, he may have not been up to it physically. True, but he was living in Monte Carlo by then, a place of mild weather compared to the rest of Europe. Though I find it significant that Philip's second son is called Andrew, which is not at all a royal name here. It is a saints name and also his father's name. Queen Victoria named her second son Alfred, a name out of circulation for at least a thousand years. I think the fact that it was his father's name was what Karlfrana was pointing out. Despite their relationship, Philip still chose to give his son his father's name. Apparently the Duke also wears his father's signet ring. I think Philip cherishes his father, although they did not have the time to be close. He once said "People think that Dickie is my father anyway." Yesterday, PBS showed a documentary on Alice, called "The Queen's Mother-in-Law"... Very interesting film and quite frank & factual, I think! There were films of her at Philip & Elizabeth's wedding and the Coronation. At one point, there was a portion showing The Queen Mother walking enrobed at the Coronation - and there was a comment that Alice was 'the othe queen mother'!!!! Alice eventually went to live at Buckingham Palace, where she died in 1969. I am wondering - - How did she get along with The Queen? 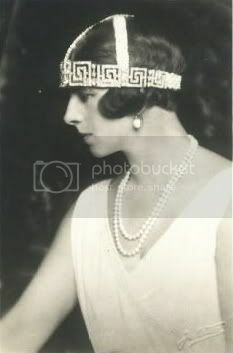 and even more - - How did she get along with The Queen Mother? Thank you for any information or comments.